Just because a piece of cookware is nonstick doesn’t mean its surface is tough against anything. It would still be susceptible to scratches if you’re using the wrong kind of whisk. That’s why we’re here to show you the best whisk for nonstick cookware. Nonstick cookware requires gentler types of whisks. 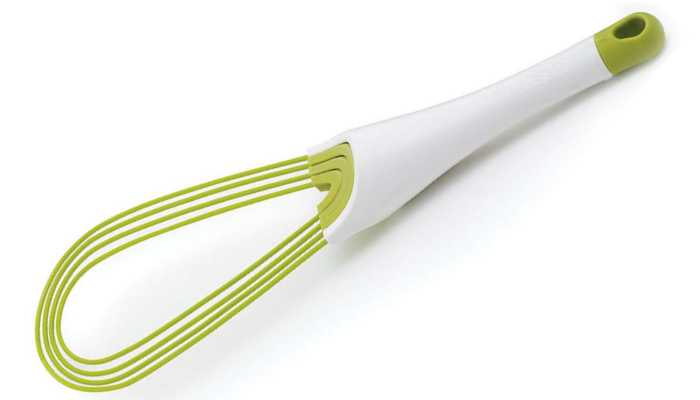 OXO Good Grips Silicone Balloon Whisk is one of the best examples. It is even ideal for metal and ceramic cookware. Silicone isn’t only great for preventing scratches. It can also resist heat up to 600 degrees Fahrenheit. Rest assured it won’t melt and experience discoloration. For long hours of cooking or baking, this whisk has a soft handle to keep your hands comfortable no matter what. Its handle even has a teardrop shape to fit your palm perfectly. It is also nonslip for better control even when wet. Of course, let’s not forget about cleaning convenience. This product is definitely dishwasher-safe. That shouldn’t be a surprise anymore, considering that it’s heat-resistant. What’s life without whimsy? 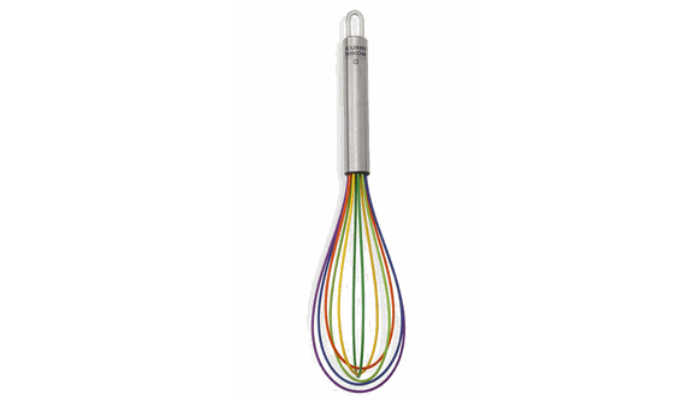 Kuhn Rikon Silicone Rainbow Whisk obviously serves its purpose, but its colorful nonstick wires make it stand out from the crowd. It can be an interesting addition in your kitchen. While the top product has a teardrop-shaped handle, this one has a straight form which you might prefer. 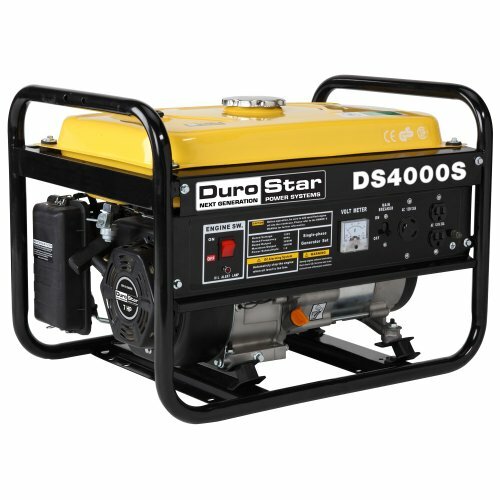 Its handle is also made of stainless steel for durability. As a plus, it has a loop for easier storage. With its wires specifically made of silicone-coated steel, Joseph Joseph 20071 Whisk will never scratch your nonstick cookware. The steel composition is helpful for a sturdier design. This product may look flat at first, but when you turn the handle, it becomes a balloon whisk. The reason for its collapsible feature is easier storage. You’ll be able to hide it in a drawer if you want. If you cook or bake various dishes all the time, you should resort to products like TEEVEA Sturdy Silicone Balloon Whisks. 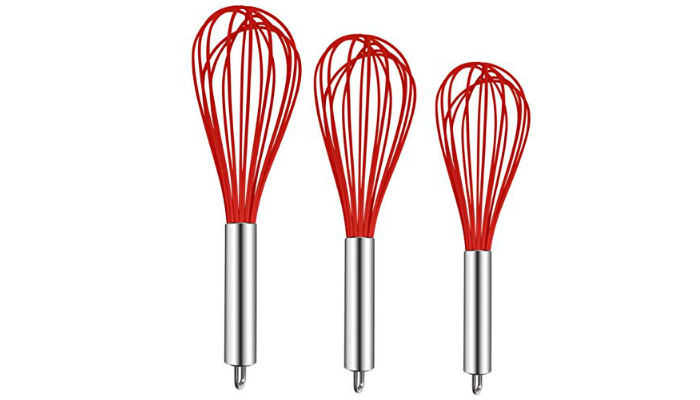 Aside from having three whisks in just one purchase, you’ll have the chance to own three different sizes. We believe that’s more practical than having multiple identical pieces. More importantly, each whisk is so strong that it can mix thick food like gravies and candies. Despite that awesome benefit, it will remain safe for your nonstick cookware. For thick sauces and creams, Cuisinart CTG-00-SWB Silicone Whisk is a decent choice. It can still resist temperatures up to 460 degrees Fahrenheit. And, sure, it is super-gentle for nonstick surfaces. 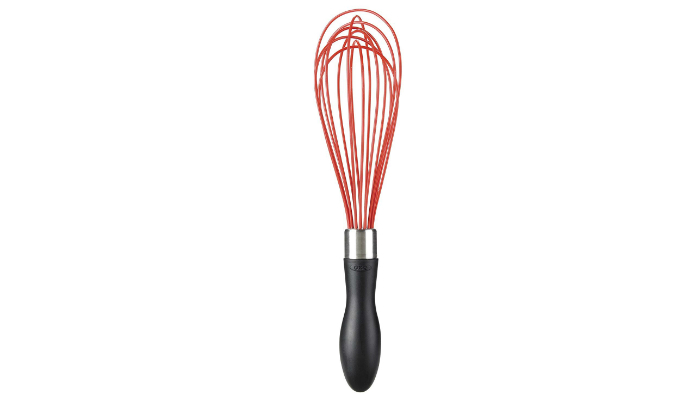 Because of the color and durable materials of this whisk, its appearance will remain brand-new even with heavy use. It will look good in your kitchen for a long time. Even with its cheap price, StarPack Home Basics Silicone Whisk is great for keeping your expensive bowls and pans safe from scratches. It has tough stainless steel wires for sturdiness but coated with silicone for a softer feel. 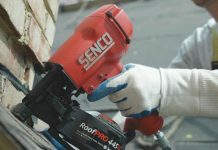 Since safety is also a priority, it is guaranteed that the wires are covered with FDA-grade silicone. They’re also BPA-free and proven to be 100% safe through standard tests. Choosing the best whisk for nonstick cookware is really simple. You just have to consider the material and design. Our top product is a silicone whisk. It is an excellent combination of the wire and silicone-coated types. It will always be the best option for nonstick cookware. 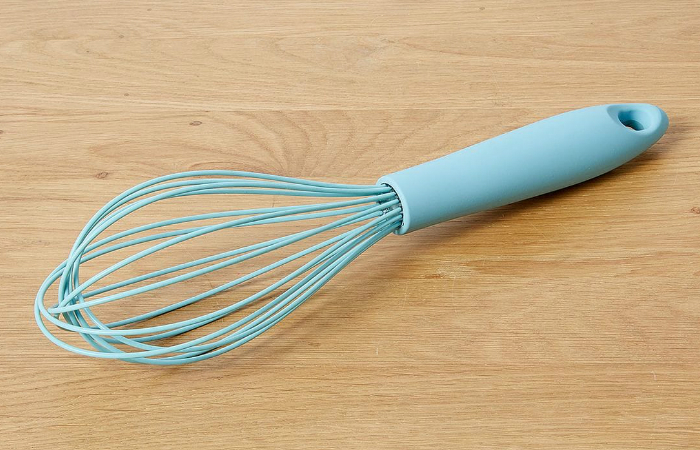 Now, let’s understand the benefits of wire and silicone whisks. 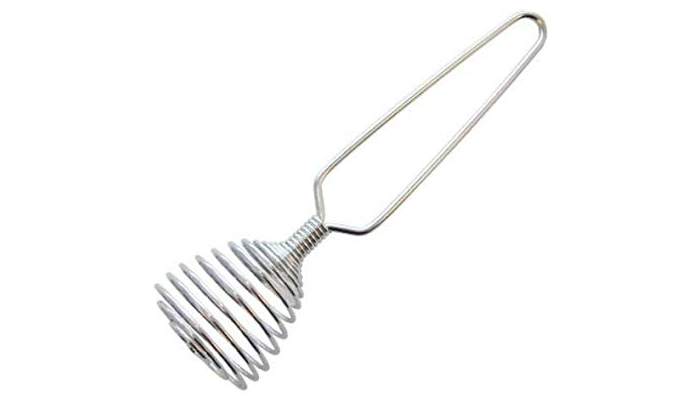 First off, wire whisks are the most popular for home cooks because of their basic design. They simply have sturdy metal wires that are flexible enough for perfect mixing or whipping. However, metal wires can definitely scratch any surface. They require a soft coating to be safer for your precious pans, bowls, and other types of cookware. And, that’s where the silicone type comes in. 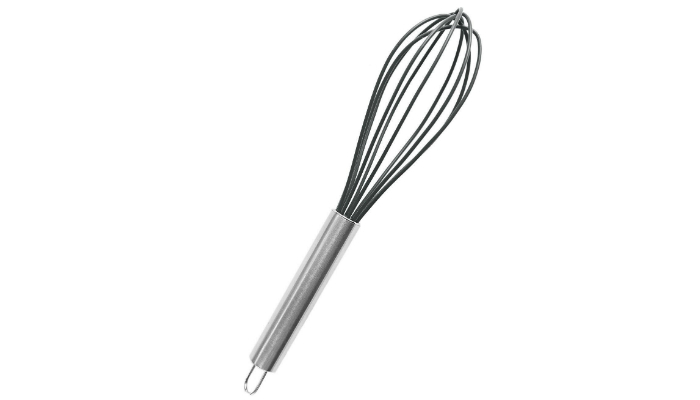 It is technically a whisk that still has metal wires but coated with a protective covering. As a plus, silicone is nonstick and heat-resistant as well. You can easily clean it in a dishwasher. 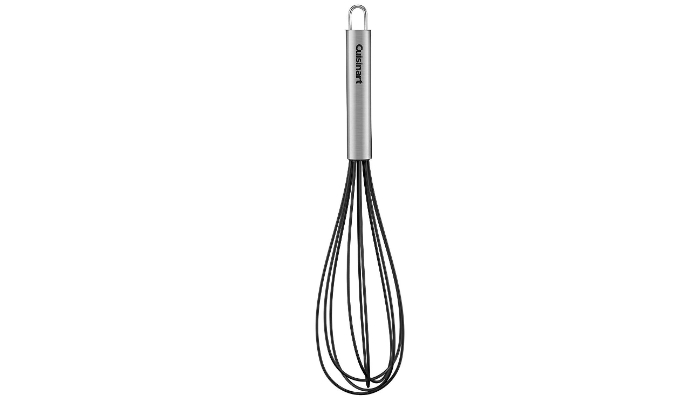 The major types of whisks according to design are balloon, French, flat, spiral, ball, coil, and cage. When it comes to ultimate versatility, balloon whisks are ideal. What’s so great about the “balloon” design? It turns out that having several flexible wires is highly effective for both simple and complex kitchen tasks. Balloon whisks can perfectly beat eggs and cream to make meringues and whipped cream. They can also do simpler things like mixing dry ingredients for sifting. What about other designs? You might need a couple of them in the future. Let’s start with French whisks. They are the longer, narrower versions of the balloon design. This design is perfect for creating sauces. Meanwhile, flat whisks are convenient when you mix something in a frying pan or skillet. They’re also called roux whisks because of their purpose. Next are spiral whisks. They have an interesting design to mix ingredients without burning anything. That’s why they’re effective for making sauces and vinaigrettes. Now, here’s something more unique. 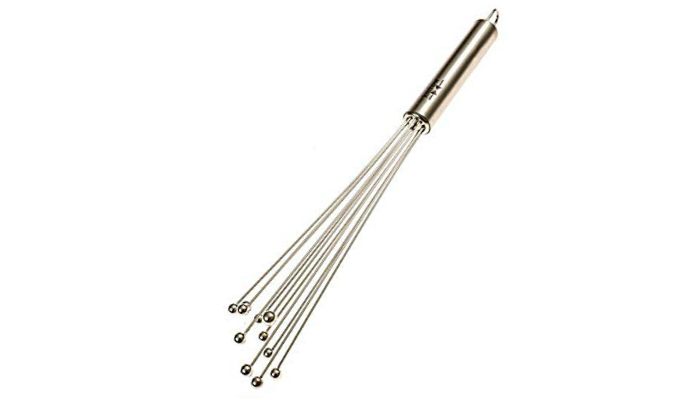 Ball whisks have straight wires with a ball on each end. They’re good for whipping egg whites fast. 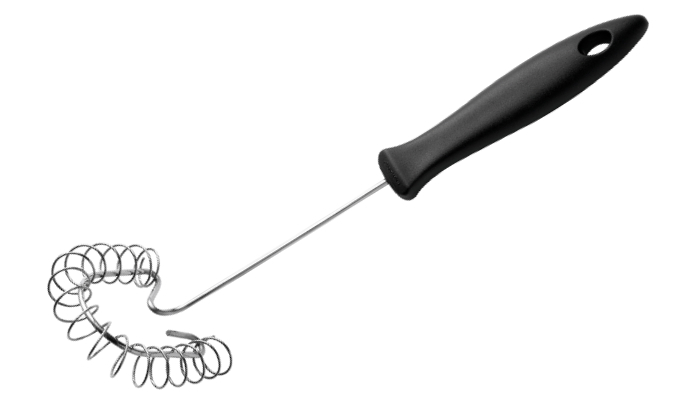 On the other hand, coil whisks have a round form, just like the balloon type. However, they only use one wire to lift mixtures effectively. 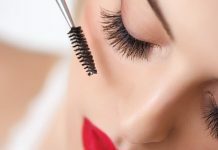 Using them will require you to move your hand up and down, not in circular motions. 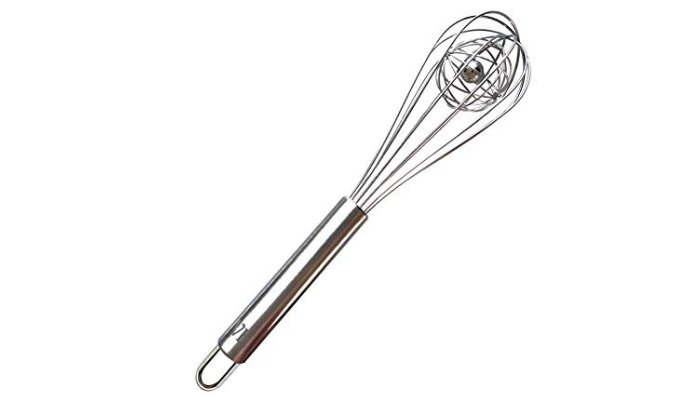 Lastly, cage whisks are similar to balloon ones, except for their additional set of loops and weight inside the ball. The purpose of using a heavier whisk is to make thick mixtures of better quality. After considering its material and design, we ultimately selected OXO Good Grips Silicone Balloon Whisk as our number one product. As the best whisk for nonstick cookware, it can withstand an extreme temperature of 600 degrees Fahrenheit while protecting surfaces from scratches. For other kitchen devices you might like, check out the best hand mixers and immersion blenders. To expand your knowledge as a home cook, learn how to make chili and bake bread in a Dutch oven.